Meander through Derry’s inner city and listen to the echoes of 1,450 years of history. Stroll along its 17th century walls and see the ever-changing skyline of a city constant in the warmth of its welcome. 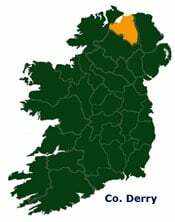 Derry is the only completely walled city in Ireland. Developed by the City of London in the early 17th century, it was given a charter in 1613 and endowed with a new name – Londonderry. Monastic site, plantation city, and thriving cultural center: many and varied are the roles that Derry has played in the rich pageant of Irish history. An ancient city with a youthful, vibrant heart, Derry really is a special place.